A group of maize experts from the Thailand Department of Agriculture (DOA) has visited their neighbouring country, Laos from 2-6 May 2016 to learn about the country’s native maize varieties and to share their technical guidance and know-how in producing hybrid maize seeds. 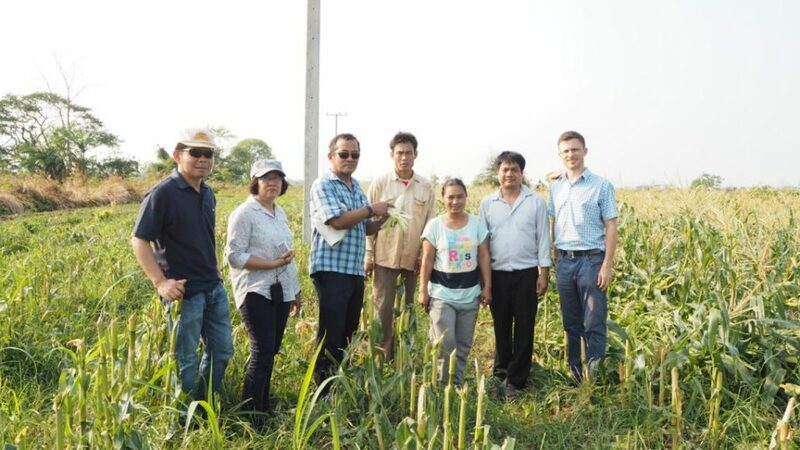 This activity is a follow-up to the four-day study mission of Lao PDR delegates from the National Agriculture and Forestry and Research Institute (NAFRI) when they visited the Field and Renewable Energy Crops Research Institute and Nakhon Sawan Field Crops Research Center (NSFCRC) under the Thailand DOA in January 2016. Laos is largely bedecked with the Mekong River and mountainous landscapes which extend across most of the northern part of Lao PDR. The topography and climate in Laos allow farmers to grow maize. In Xayaburi province alone, maize plantations are a common sight and can be seen along the highways. Farmers in Laos cultivate their own native maize for additional income, however, majority of them primarily grow imported maize seed (MX 10) from Thailand and Vietnam (LVN 10). To increase the resilience of Lao maize farmers to climate change and to overcome some of the challenges the Lao maize sector is facing, NAFRI welcomed maize experts from Thailand DOA to share their technical expertise and experiences in the Thai model of “Village Based Maize Seed Production” to enable Lao farmers to commercially produce hybrid seeds which can then save cost and reduce its vulnerability of drought. To decrease Lao PDR’s dependence on maize seed imports, NAFRI welcomed the maize experts from the Thai DoA Thai to share their technical expertise to the technical staff of NAFRI as well as extension officers from major maize growing districts in a two-day training in NAFRI. Some participants also participated in the four-day study mission to Thailand, where they experienced the ability of Thai farmers to commercially produce hybrid seeds and thereby save cost and reduce the vulnerability to drought. The visit which took place in the first week of May 2016 started by exploring maize production in the provinces of Sainyabuli and Xayaburi to give the Thai experts a better understanding of the conditions and common practices on Lao maize farms. 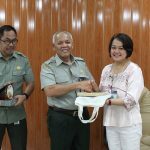 The visit was followed by a 2-day training provided by the Thai experts. Their shared their knowledge and experience on hybrid maize breeding techniques, the conservation techniques for native maize variety, and the Thai system for community based production of hybrid maize seeds. Also on the agenda was soil conservation and nutrient management, an issue increasingly causing problems in Xayaburi district were erosion on maize farms is widespread. “I learn a lot about maize breeding particularly about hybrid maize from this training. It is good to improve my capacity as technical staff. I plan to share this knowledge with my colleagues in South and North of Lao PDR,” states Mr. Khamphanh Xayyalat, technical staff for maize breeder of NAFRI, who attended the training. After the training,Dr, Khamtome Vanthanouvong, from NAFRI discussed with his team the way forward to enable hybrid maize seed production in Lao PDR. As an immediate follow-up NAFRI plans to send some of their technical staff to the Nakhon Sawan Field Crops Research Centre for an extended time so that could increase their technical skills and deepen their understanding of the Thai village based seed production model. 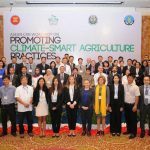 The study mission as well as the return visit of Thai experts to Lao PDR is a part of the knowledge exchange between ASEAN Member States (AMS) under the ASEAN Climate Resilience Network (ASEAN-CRN) which promotes the scaling-up of climate smart agriculture practices in the region. 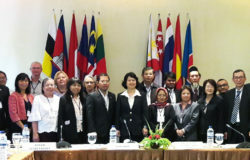 The ASEAN-CRN is supported by the ASEAN-German Programme on Response to Climate Change (GAP-CC) which is funded by the German Federal Ministry of Economic Cooperation and Development and implemented by Deutsche Gesellschaft für Internationale Zusammenarbeit (GIZ) in close cooperation with the ASEAN Secretariat (ASEC).